When I corresponded with Laurie online and mentioned that I was just starting to read Diane Stein’s Essential Reiki, recommended by another friend. It seemed to me that Reiki might be highly complementary to healing methods which I was already studying (I’m a novice at T-touch with Linda Tellington-Jones). I also attended my first animal communication seminar this year. I am fortunate to have a wonderful, holistic veterinarian, so I know that new methods and techniques will at least be treated with respect, if not integrated into my animal family’s treatment. I talked to Laurie about the stiffness my 10-year-old Greyhound, Cedric the Sidekick, was experiencing. He had some racing injuries that were not serious, but had been exacerbated by his being tied outside for the first three years of his “retirement.” When I adopted him in December of 1997, it was a challenge for him to get up after a snooze. Cedric has benefited from acupuncture and is taking ArthriEase™, a glucosamine combination, and another natural anti-inflammatory. These treatments and therapeutic massage that I’ve done at home have helped him tremendously. I was eager to see if Reiki could help him further and was thrilled when Laurie invited us to participate in the demonstrations. My first visit to Dewey Beach, Delaware, was something of a sensory overload. I wanted to attend this event for four years and found it to be everything people said: fun, educational and “good for the Greyhound-loving soul.” Educational seminars were scheduled during the day on Saturday in the two huge tents set up on the Bay Side of Dewey Beach—the very same tents which would house a delightful shopping extravaganza on Sunday. Saturday afternoon we were supposed to be at the Reiki seminar by 2:00 p.m. Unfortunately, we were running a little late since we had taken the boys to the lunchtime fun run at a local school field (big and well-fenced), where my somewhat sedentary Cedric was bowled over by a herd of galloping beasties. Although he was shaken and a little scraped, after a short nap we stiffly made our way to the seminar tents. At this point I figured Cedric could really use some Reiki. When we finally arrived, we found both sides of the big tent were filled with people listening to or watching different speakers. On the Reiki side of the tent, people sat in small groups with their dogs, watching and listening and waiting their turn. Laurie Rhodes began by explaining that Reiki does no harm and that it works as a complement to regular veterinary treatment and benefits physical, behavioral and mental concerns. She went on to say that those seeking Reiki treatment for themselves or their pets should find someone they are comfortable with locally. Laurie shared a couple of her own Reiki experiences and the experiences of those using Reiki with animals. She also talked about how animal communication comes into play in Reiki. She touched on the importance of Reiki for our four-legged friends because they absorb so much of the atmosphere around them: our stress, grief, and garbage. She talked about the basic ideas of healing touch and about the Japanese relaxation techniques that allow the Reiki energy to flow through the practitioner. (It is very important to me that Reiki is a healing modality in which positive, healing, universal energy (however individuals name it, according to their belief systems) flows through. In other words, the practitioner is not using or depleting his or her own energy. But this article is not meant to be an in-depth piece on Reiki. There are books and teachers for that. It is simply a report of what I saw and experienced with Reiki at Dewey Beach this fall. Laurie was on her knees in the cleared area at the front, working gently on a reclining Greyhound and talking with the dog’s person. Another woman who had enough Reiki training to be able to give treatments was assisting by working with some of the Greyhounds toward the back of the lecture area. I have to mention Snug. Snug was a very beautiful and special Greyhound. Dark and handsome, with a Roman nose, he and his “foster Mom,” Kathleen Walsh and his brother, Phoenix, made a bittersweet and meaningful journey to Dewey. They came to “Greyhounds Reach the Beach”, and to the Reiki seminar so that Snug could receive Reiki and so he could experience, and receive joy and love from Dewey attendees. You see, after a very hard life, Snug came into Kathleen’s life to be her special angel. Snug was dying of cancer and came to Dewey to experience the beauty of life before journeying to the Rainbow Bridge. Kathleen’s eyes were filled with tears and there was a gathering around the regal boy on the blanket, with everyone speaking softly, petting and giving love. There was also a reporter from The Washington Post who seemed fascinated by what he saw and heard, about Reiki, Greyhounds, and Snug. When it was Cedric’s turn for treatment, I explained to Laurie what had happened to him at the playground, and that he was more stressed than usual. She placed both hands on Cedric; immediately he was restless, fidgeting, as energy obviously began moving. Without force or coercion, Laurie kept her hands on my big boy, very focused, changing hand positions periodically. After a few minutes, she removed her hands briefly, at which point Cedric carefully laid down and placed his head in her lap to receive the rest of his treatment. By the time she was through, he had almost gone to sleep. Laurie then made arrangements to see our other Greyhound, Harley, who has a crushed foot and a limp, at Berry Best Bakery’s temporary Dewey shop. Harley’s response to the treatment was similar, and perhaps more intense, than Cedric’s. I’ve rarely seen my boy more relaxed. In both cases, my Greyhounds’ well being was visibly enhanced. In both cases, I actually felt it. What I saw and felt during the Reiki sessions at Dewey Beach made me comfortable and enthusiastic about pursuing the study of Reiki to integrate this ancient, oh-so-simple, and beneficial healing method into my life. 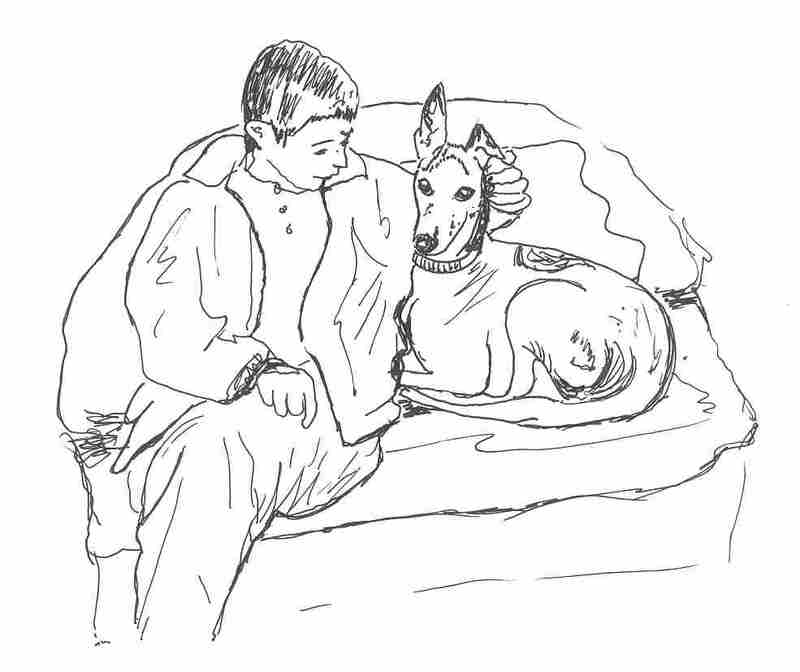 I suggest that anyone who is interested in Reiki for themselves and their companion animals take Laurie Rhodes’ advice—find someone with whom you are comfortable. It certainly made my first experience with Reiki a pleasant and enlightening one. This piece was wonderfully written! I’d felt like I visited there for a moment myself. Snug’s part in this story brought me to tears. I wish my dear departed Snowboy would have had the opportunity to experience the Reiki before his own trip to the rainbow bridge earlier this spring of 2010.